Napoli defender Kalidou Koulibaly praised referee Massimiliano Irrati for suspending a top-flight Italian match because of apparent racist chanting. The game at Lazio was stopped for three minutes after booing from some home fans when Koulibaly touched the ball. Irrati continued after consulting with coaches and officials, with Napoli winning 2-0 to stay top of the league. "I want to thank the Lazio players, but especially the referee Irrati for his courage," Koulibaly wrote. The French-born 24-year-old Senegal international began his career at Metz and joined Napoli from Belgian side Genk in 2014. Wednesday's Serie A match at the Stadio Olimpico was stopped in the second half because of the chanting that Koulibaly described as "ugly". The defender gave his shirt to a child in the crowd after the game. Writing on Instagram he said: "I thank my team-mates, the public and our fans, who have been a great support against these ugly chants. "I want to thank everyone for the messages of solidarity which I have received." Lazio manager Stefano Pioli insisted: "I would not have stopped the match. It was chanting from the minority, but I don't think they were racist, we also have players of colour and they are treated well." 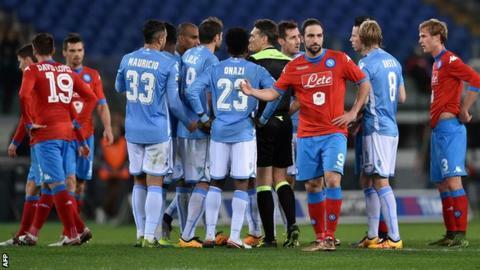 But Napoli counterpart Maurizio Sarri backed the decision and wrote on Twitter: "Bravo to Irrati for stopping the match."